Listed as a Historic Monument in 1991, the astronomical clock at Saint-Jean de Besançon Cathedral was designed and made by French clock-maker and mechanic Auguste-Lucien Vérité between 1858 and 1860. Installed in a room in the lower section of the clock tower, the astronomical clock is the central component of a very important mechanism. In fact, it is responsible for turning the clock dials inside and outside the cathedral and the two Comtoise bells. The clock itself is composed of 30,000 individual parts: 57 dials function in one movement and give 122 interdependent indications such as the hour, date and season as well as the signs of the Zodiac, solar eclipses and phases of the moon. 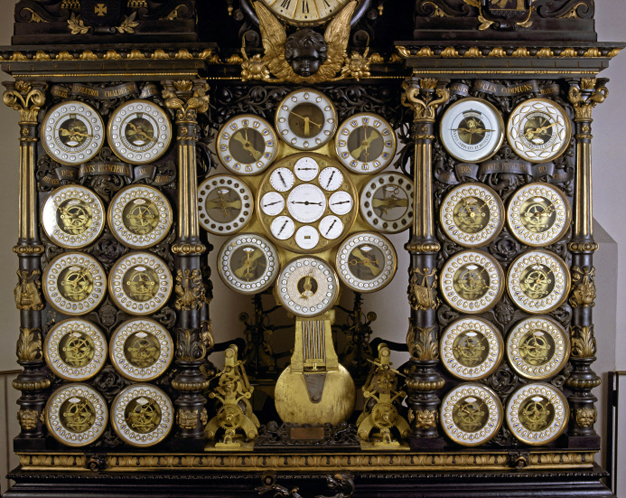 The upper part of the clock features a group of automatons. The automatons come to life when each hour strikes and present scenes inspired by the Bible.